My quest to conquer my own problem skin and hypersensitivities led to much more than I anticipated–the birth of my own skin care company. I never intentionally set out to enter the beauty industry, so it’s probably more accurate to say that I found myself in it! I had sudden onset adult acne coupled with extremely oily sensitive skin from my early 20’s and was left with many acne scars and hyper-pigmentation. Having spent literally thousands over the years on very expensive products that just dried out my skin even more, causing my skin to produce more oil to compensate, more breakouts to contend with, I was exasperated, considerably out of pocket and bitterly disappointed after yet another wonder product failed to live up to its promises……. I decided there had to be a more natural, gentle and healing way to deal with my skin issues. So for purely selfish interests, if I couldn’t buy it out there for myself, then I decided I’d make my own! So I undertook a couple of years of extensive personal research, education and study, investigating the use of natural, plant-based treatments as solutions for my own skin issues and sensitivities, undertaking several intensive natural skincare courses, accumulating knowledge and experimentation. The more I learned, the more my passion and interest for the subject grew, and it was while experimenting with various botanicals, plant oils and essential fatty acids and antioxidants that I discovered their benefits and ultimately healed and transformed my own skin. Through a great deal of trial & error I have perfected the art of packing a lot of active ingredients in every bottle which results in a multi-active product. From there, family and friends expressed great interest in trying my products, so armed with a skincare questionnaire I insisted they filled in, including an iron-clad promise for honest, detailed feedback, I formulated specific products for their skin type. The results blew me away, everybody loved them, believed in their effectiveness and so with lot of encouragement, support and love, GeorgiaJane Skincare was born. Due to the new EU Cosmetic Legislation which came into effect in July 2013 which introduced even more stringent safety protocols, which can only be a good thing for the consumer, I believe this industry will undergo a transformation. 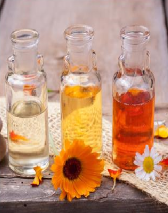 I would like to see the profusion of products that currently dominate the market shrink down to the necessities, and the products that do remain become increasingly focused on natural ingredients. As a company we believe that as long as customers experience sensitivities, whether to artificial perfumes & colours, overuse of suspect preservatives and synthetic ingredients, they will demonstrate less trust in products which in turn will force companies to become more accountable to their customers. I believe in the simplicity, purity and efficacy of what nature has to offer. This is really what GeorgiaJane is all about: using plant oils, botanical and marine actives, plant based peptides, amino acids, natural gelling agents and hypo-allergenic emulsifiers to produce effective skincare without petrochemicals, sulphates, parabens and synthetic or artificial ingredients, colours or perfumes. I believe that potentially toxic petroleum derived chemicals and 100% ‘lab derived’ ingredients should simply not be in the products we use on our skin on a daily basis. Safe, naturally derived ingredients are better for our health and being more compatible with our biological skin makeup, they can and do deliver visible and stunning results! GeorgiaJane Skincare is passionate about only using natural, botanical and nontoxic ingredients for our and your skin health and for the results they deliver, feeding the skin with powerful nutrients. My goal is to give every woman the opportunity to experience skincare with a difference.